I’m thinking about blogging. Okay, thinking is not the same as doing but not doing is what has prompted me to think (if that makes sense?). I started this blog full of the intention to post weekly, but I’m finding that sometimes life gets in the way. The past few weeks have been particularly busy for me with work (paid), work (unpaid) and various activities. Training sessions for new volunteers at the mental health charity where I work are now in full swing, and I help with these. It’s very time-consuming but I love doing it. Never before in my life have I had a more interesting, fulfilling job. 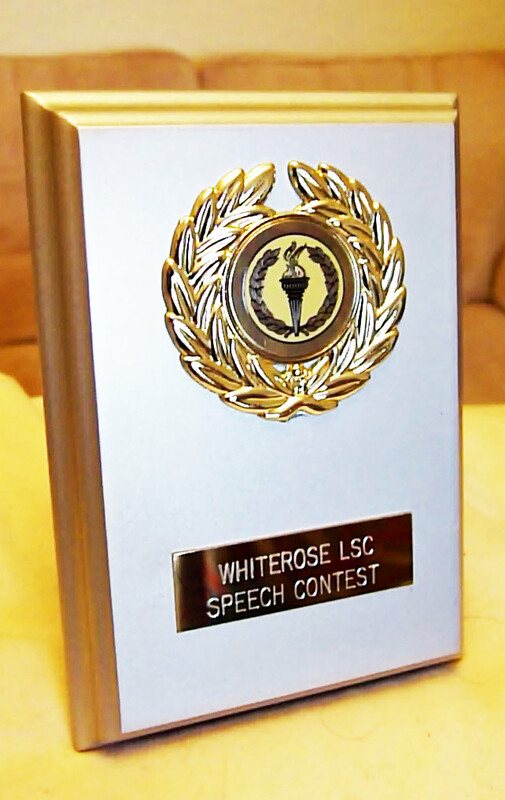 I won a Speech Contest at my local ASC (Association of Speakers Clubs) branch. Here is a photo of my award to prove it! This has led to my entry into the Area Speech Contest to take place at Addingham Hall this Saturday (help!). So I’m busy at the moment in preparation for that. I’ve just had a go at doing my speech for Saturday on video camera to see what I look like in action. OMG! Think it’s a case of – Jean tries hard but needs more practice. Meanwhile, I’ve been re-writing the first few chapters of my novel-in-progress. Will I ever be satisfied with this? I’ve also been busy preparing and delivering a teaching session to AMHP students at Bradford University – and doing loads of other stuff, which all seem to have come up to demand my attention at around the same time. And I know that all this sounds like making feeble excuses while other bloggers with busier lives than mine keep up their regular posts. But I figure that occasional posts for a while are better than none, and I do intend to resume the weekly posts soon. This entry was posted in Uncategorized and tagged AMHP students, ASC, mental health, speech, talks, writing by Jean Davison. Bookmark the permalink. Hi there! you’ll see I’m under another name, just playing around with my own blog identity!! since I pressed a wrong Widget button on Leeds Wellbeing blog and they lost their Tag cloud!…..temporarily!! thank goodness, being laid low with the eye problem means more time to ……play around with blogging, in between scratching…oh can I borrow your Marigolds! I’m not sure anyone could be more busy than you and well done, hey it’s a big award, well deserves its own sofa!! can you finish the novel by New Year? All the best with Uni. talk. Lilypearl, Thanks, the Uni talk seemed to go very well. Now that I’ve got a bit more time, I’ll press on with the novel. But can I finish it by the New Year? It depends WHICH New Year you mean! Steven – Thanks for visiting here and leaving a comment. I was the Runner Up in the bigger contest, which I’m very pleased with. It’s great to know that people are reading my posts. Hearing that you’d like to see a post a week gives me much encouragement to try to keep up to the blogging. I appreciate your comments and thanks again.